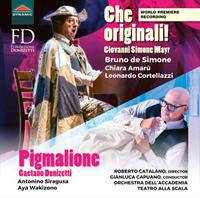 Description: Two rarities: the Donizetti, the old statue-comes-alive gambit, was his first opera but it wasn’t premiered until 1960 (a CD of this was issued by Myto in 2011 - 01M026). There is only one previous recording of the Mayr farsa (on Guild in 2000 and no longer available) whose main character is a head of household mad about music. 2 CDs. Libretto and translation available online. Orchestra dell’Accademia Teatro alla Scala; Gianluca Capuano.